The Revenant is based on the true story of a group of pelt traders in 1823 (in the region that is now South Dakota). 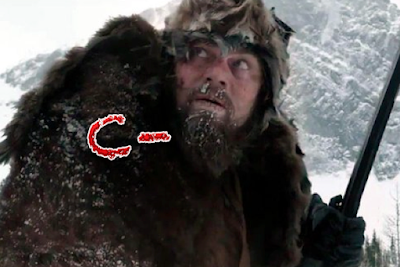 When one of them, “Hugh Glass” (DiCaprio) is left for dead by the rest of his party, the struggle for survival goes up a notch. The movie’s chief source of inspiration comes from a modified tale in a novel by Michael Punke bearing the same title. Hugh Glass is played with much determination by Leonardo DiCaprio as a smart, resourceful man who falls on bad luck when he is mauled by a protective mother grizzly bear. Preceding that, the movie takes off with an attack on the traders’ party by a band of Native Americans who are searching for a woman taken from their tribe. Pause to emphasize: I have NEVER in my life seen a movie where arrows shot by Indians are this accurate—they almost never miss their targets in battle after battle! 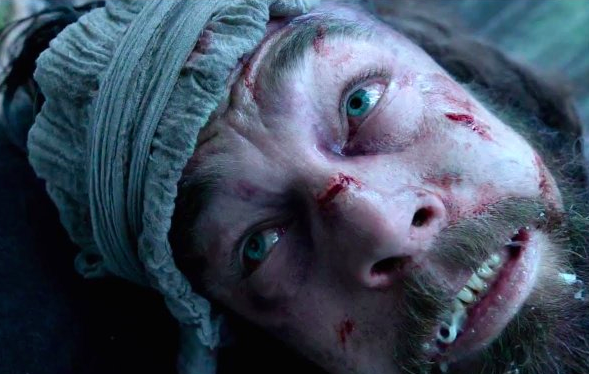 The Revenant (so titled with the suggested meaning of one who returns, possibly from the dead) is a long movie, and it feels it every step of the way. Director Alejandro G. Iñárritu (the guy who brought us the excellent 2003 movie 21 Grams) leaves no confusion behind in what he intends to do. He wants to make sure everyone knows how much the main character suffers before coming to a point where he can extract his deserved revenge. The suffering bill: Paid! Minus the special affects of something Michael Bay would produce in a lifeless Transformers sequel -- but with the same gratuitousness -- this movie is extremely excessive in the lengths it goes to convey the masochistic suffering of its main character. When Glass goes up against the grizzly, the gore is not only grotesque, but downright overbearing. Ten to one the director has a weird pain fetish of some sort. The encounter with the bear leaves Glass right at death’s doorstep. When he can be carried no further, the captain, “Andrew Henry” (Domhnall Gleeson) solicits volunteers to care for Glass right until the end of his life. It is then that “John Fitzgerald” (Tom Hardy) goes about becoming the antagonist—with a justification for his actions that seem justified (the way the movie has it set up, it made sense to put a hopelessly injured man out of his misery rather than to risk everyone else's life by dragging him along). The camerawork is fascinating. Some characters, although at certain times and places bordering on hollow, are generally constructed with a lot of thought. “Jim Bridger” (Will Poulter) and Glass' half-Native-American son, “Hawk” (Forrest Goodluck), both competently playing their parts, become involved in a struggle with Fitzgerald when the matter of their survival becomes a more pressing issue. In the aftermath, Glass is buried alive, leaving him to have to free himself and begin the long journey to right the wrongs against him. And that’s all the movie does—lead us through one obstacle after another, which makes for - dare I say - a boring, one-note experience! I found the viewing both tiring and exhausting after the bear attack (which itself ran too long). Even with the necessary dramatic pauses and Glass’ flashbacks to the earlier killing of his wife (Grace Dove Syme), the film’s budget suffers from the defective screenplay that was built only on grueling and prolonged displays of pain. What legitimate drama it had to build on was quickly sucked into the vacuum of this dire, endless series of agonizing predicaments. There is not much else for audiences to grab onto, nothing else to breathe life into the project. This made what could have been a fabulous movie into a profoundly misguided one. 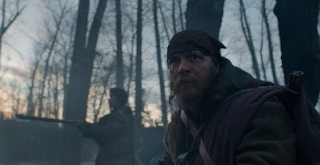 Had it showed up as an Indie project with no-name actors, The Revenant would have been much more worthy of its (undeserved) accolades, but as it is, it’s a grim, overlong testing of who in its audiences has the most masochist sense of appreciation.